Monet is one of my favorite painters of all times and as many of you know he made a lot of beautiful impressionist paintings of the Water Lilies in his garden. These paintings have always given me great peace and the very first "real" (meaning bigger then for the cat's) quilt I made was greatly inspired by these paintings. 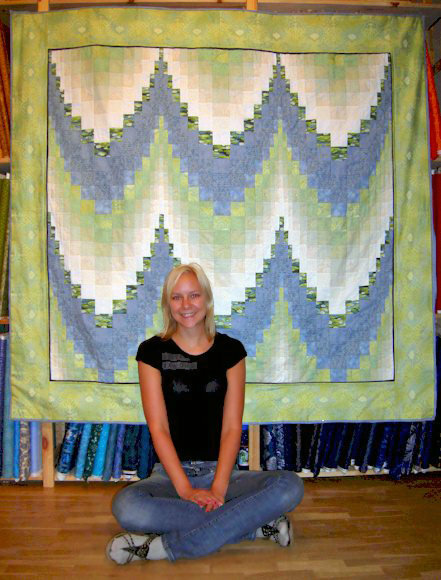 It's a bargello and I simply call it "Monet's Water Lilies", the contrasting fabric is actually water lilies. One of Monet's many Water Lily paintings, this one can be found at the Art Institute of Chicago and was painted 1906. Picture is borrowed from Wikipedia. Another one, can be found at Dallas Museum of Arts, painted 1908. Picture is borrowed from Wikipedia.